Dr. Edmund S. Boice was Surgeon-in-Charge at Park View Hospital, arriving on its opening day. Dr. Bryd C. Willis arrived shortly thereafter. The doctors borrowed money from their families and together bought a controlling interest in Park View Hospital. 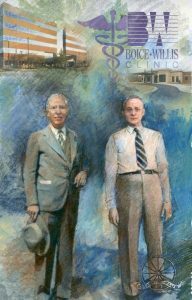 Inspired by the success of the Mayo Clinic and their friendship with its founders, they went on to form the Boice-Willis Clinic, which has served Eastern Carolina for almost a century.